Dr. Neil DeGrasse Tyson might have gained a reputation for nitpicking the (bad) science of films like Gravity and The Martian, but the well-known astrophysicist is almost as big a proponent of pop culture as he is of his chosen field. In addition to his continued work as the director of American Museum Of Natural History’s Hayden Planetarium, Tyson expends considerable energy making science more accessible. The cosmologist frequently delves into the overlap between science and pop culture, either to promote astronomy on The Late Show With Stephen Colbert or extolling the accuracy of Deep Impact’s celestial collisions. Tyson has also made more formal efforts to increase the visibility and accessibility of science, including hosting Fox’s Cosmos: A Spacetime Odyssey, from executive producer Seth MacFarlane. 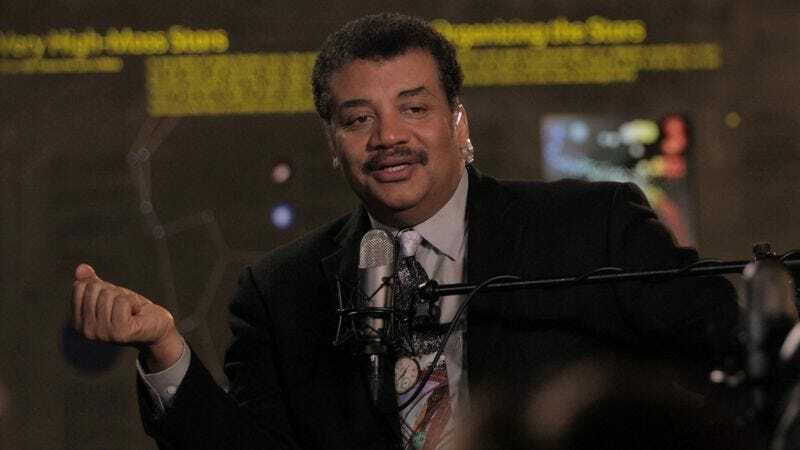 He’s also the host of StarTalk, a podcast that brings together pop-culture figures and scientists for freewheeling discussions about everything from weed to cosmology to women in STEM. The popular podcast has been adapted for TV by the National Geographic Channel; Tyson hosts the series, with frequent visits from Bill Nye and field reporting from comedian Chuck Nice. The series has taken off, and not just among the doctoral crowd. National Geographic also recently published the companion book, StarTalk: Everything You Ever Need To Know About Space Travel, Sci-Fi, The Human Race, The Universe, And Beyond. With StarTalk gearing up for its season premiere on September 19, The A.V. Club spoke with Tyson about popularizing science and eliminating the gatekeepers, who are often ourselves. The A.V. Club: StarTalk will soon kick off its third season, which, at 20 episodes, is jam-packed with celebrity appearances. It’s twice as long as season two. Was that intentional or did you have so many people clamoring to be on the show that you had to extend the season? Neil DeGrasse Tyson: We’re entering our third season, correct. But the show as a concept predates its television show. The show was born as a radio program out of a National Science Foundation grant. Then it went to podcast, and then went to satellite radio, and then National Geographic took notice and decided to cherry-pick our 50 episodes that we make in a year, and put 20 of those 50 episodes on television, with a whole studio. So that’s the construct here. So those ones you see on TV will also appear in our audio outlets with a small time delay from when they appear on television. But we’re delighted there was that level of interest. This past year, we received our second Emmy nomination for Outstanding Informational Series. While we’d all like to win, I can say with utmost sincerity that it mattered more to me that we got noticed than whether or not we win. To get an Emmy nomination for a show that was the first-ever science talk show on television to us was an affirmation that there is an appetite for this content in the mainstream public, not just the erudite public. So we’re all completely thrilled by it. And this next season, National Geographic decided to get 20 instead of 10. There’s no shortage of people that we can put on, because science touches us all. Science, and its impact on a person’s livelihood is the common denominator. The people we have as guests can be as diverse from one another as you would ever see in any show ever. AVC: Yes, anyone who’s jumping in for the first time will get a sense of that right away. For example, the second episode of season three features Nerdist founder Chris Hardwick and Dr. Summer Ash [director of outreach for the astronomy department at Columbia University]—and you, of course. NDT: I’m trying to remember, in that episode, who was the main interview? NDT: Mayim Bialik, that’s right. So we used Miyam Bialik as the hook, for people who are Big Bang Theory fans, or fans of her and her career as an actress, and then we used that to come back in the studio, and then I have my two—I think of them as my valves, my comedic levity valve, and a content valve—that I turn up and down depending on the needs of the moment as the show unfolds. In that way, we can assure a consistent and persistent level of entertainment to content from one show to the next. AVC: Your interview with Mayim Bialik in particular is one that will resonate with anyone who’s ever felt that an immediate grasp of science is the bar for entry. That is, you can only move forward with studying it if you have a natural inclination for it. She admits that she didn’t grasp it right away, but stuck with it anyway. She points out that everybody learns differently, so you can have a passion for science without necessarily having the aptitude for it right away. NDT: In fact, I would expunge the word “aptitude” from our vocabulary, because if you’re interested in something, that’s all that matters. You’ll spend more time doing it, that than anything else, and possibly more time doing it than anybody else. And that’s all that matters, because in the end, if you love what you do, you’ll be your best at it compared to anything else you might have chosen as a career. Or at least you will love it more, and you won’t lead a depressed day of your life. AVC: That is a great point. A lot of people get hung up on establishing—if we’re scrapping the word “aptitude”—a proficiency for something right away. But, as Dr. Ash notes, girls and boys, in school, in their earlier years, they have comparable grades and interest in science. But there’s a shift in college and in post-graduate work, and especially once it comes time to get a job in one of the STEM fields. This makes featuring someone like Dr. Ash—who’s studied radio galaxies and supermassive black holes—on StarTalk equally important for adult women. NDT: Of course, especially since adults are in charge. The StarTalks—while kids can watch them, they’re actually targeted at adults. Because adults outnumber kids five to one, and adults vote, and adults wield resources, and adults are heads of agencies. So if we’re going to affect policy, or affect attitudes, for me, the adults have always been the target population. AVC: Speaking of making policy, is there any pro-science law you would urge Congress to pass? NDT: I wouldn’t, because that implies that you have to force this on people. As an educator, I would rather enlighten the electorate so that when it’s time for them to put somebody in Congress, it will be self-evident that they will embrace the message and tools and discovery of science in a way that can transform our culture and even our civilization. I don’t want to make a member of Congress do something that that member of Congress’s constituents would not approve of, or would not agree to. So in that regard, I’m kind of the opposite of a lobbyist. I try to educate the public and let them make the decisions for themselves. AVC: That’s probably the best way to get somebody to learn, right? NDT: Then they take ownership of the idea. AVC: Absolutely. But even if you’re not interesting in lobbying, StarTalk has hosted several politicians throughout its run. One of your upcoming guests this season will be Ash Carter, the secretary of defense. NDT: Yes, Ash Carter is there. People who we’ll bring on who might not be household names, but they’ll have a household title. So, secretary of defense, oh my gosh, let’s get him on, and talk to him. I tried to get a head of an agency each year. We’ve had the head of NASA in a previous year. We’ve had the head of the EPA in another year. This year, we actually had the head of NOAA, but I think she got squeezed out by some other guests. But we’ll still make good use of the program, either on radio, Sirius XM, or terrestrial. So yeah, Ash Carter, in that conversation, we learned what he thinks of the future of security, which is cyber-security, which is, “What can innovations do for you?” Beyond the traditional, “How many missiles are in your silo?” or “How many troops do you have?” So he’s trying to rethink this whole military thing from scratch. AVC: That is, to put it mildly, some heavy stuff to consider. It’s a good thing you’ve got your valves. NDT: Yeah, my valves. I forgot who I had for that [particular episode]. But they’re always good people, and that way I don’t have to carry the expertise. I defer to my valves for this. AVC: How does having panelists compare with fronting a show like Cosmos: A Spacetime Odyssey, which may (fingers crossed) get a second season? NDT: Oh, thanks! We’re still in conversation about it. But the difference, of course, is that Cosmos is hugely collaborative—there are set designers and musicians and artists and screenwriters. We had two of the writers from the original Cosmos, Ann Druyan and Steven Soter. The third, of course, was the late Carl Sagan. But there, I’m scripted, and what I say has to fit visuals that are being imagined and added later. I have to properly transition between the flow of information. So when you add all that together, it’s a different kind of product than the freeform of the science talk show. AVC: So you and Seth MacFarlane are still discussing the possibility of a second season? NDT: Right. Because we’re, you know, [wondering] how much of the band can we get back together? There’s my schedule, there’s the schedule of everyone else, so it’s a matter of timing, and is there enough budget to do what we imagine. So we’re just lining up the ducks well in advance. AVC: It’s always interesting to learn who the science aficionados are in the entertainment industry, like your Cosmos collaborator Seth MacFarlane. Have you had another guest of the non-scientific variety whose layman knowledge or interest in the field kind of surprised you? Have you found some amateur scientists among them? NDT: I don’t require that the main guest have any science knowledge or background at all. It’s just, I have a conversation with them, it’s long and winding, and we find out what parts of what we learn about the person lend themselves to further scientific discussion with an expert who is brought into the studio. So that’s how that comes together. Let’s take Bill Clinton, for example. We had him last season. I learned from him—and I think it’s because it’s a StarTalk interview, and not an NBC Nightly News or CNN—that in the Oval Office, on the table that all the powerful heads of state sit around, he had on loan a moon rock. He would reference the moon rock anytime the heads of state started fighting, and were not coming to an agreement. He would say, “This rock is from the moon, and it’s 4.5 billion years old.” And everyone would just stop and reflect on this fact, and it would sort of rebalance the conversation to be one of, sort of, greater simplicity, if you will. One that would stand a better chance of converging with what needs to be agreed upon. I don’t know that he’s ever told that story to anyone. Because how would it ever come up? Unless he knew he had a receptive audience to what the moon rock is, and how long it would take to bring it under your power. AVC: The people who have been listening to the podcast since 2009 and have followed it to TV are definitely among that audience. NDT: Right, right. That’s the point, to get the people who wouldn’t otherwise think to eavesdrop on a conversation that involves science.